It's another new week, and OMG, I am going to be on my way to Taiwan in just two weeks!!! I have no idea what to expect while I am there, but I am excited to get to experience a new culture. Until I leave, I have been getting in as much stamping time as possible (it is great not to have homework!). As I said Friday, I want to share some cards with you this week that use the Six Sided Sampler stamp set and Smoky Slate Ink Pad. I used the Honeycomb Embossing Folder to reinforce the hexagon shapes of the stamp. I gave the card just a touch more interest by embossing a layer separate from the card base. The base of this card is Rose Red, which isn't a color I use often. (I don't know why, I really like it.) It is a beautiful pink color that pairs nicely with Coastal Cabana. The embellishment on this card is very simple and delicate. The Coastal Cabana Ruffled Ribbon (on the retired list and already sold out) provides a nice frame for my focal point. 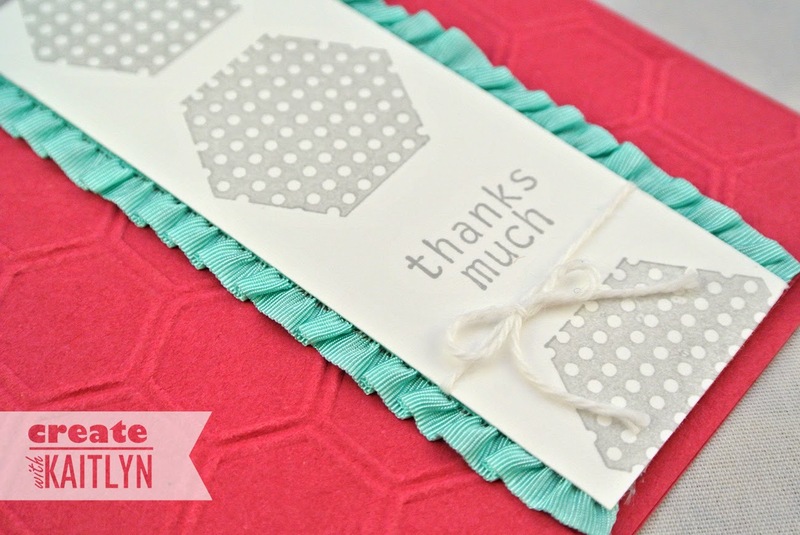 The White Baker's Twine highlights the "Thanks Much" and gives the card a finishing touch.